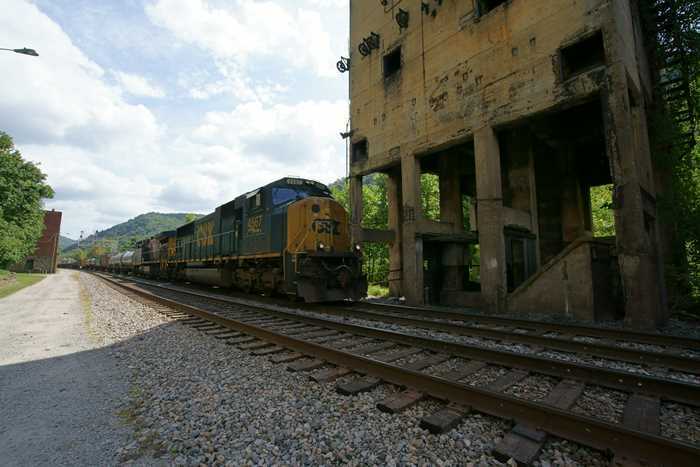 A hundred years ago, railroads were more important than actual roads in West Virginia’s small coal towns. There’s no better example than in the near-ghost town of Thurmond — a bustling town at the turn of the 20th century, where Main Street was the railroad. Now, a few pieces of the old town remain, protected by the National Park Service. All it takes is a curvy drive through the mountains to experience the area’s history. 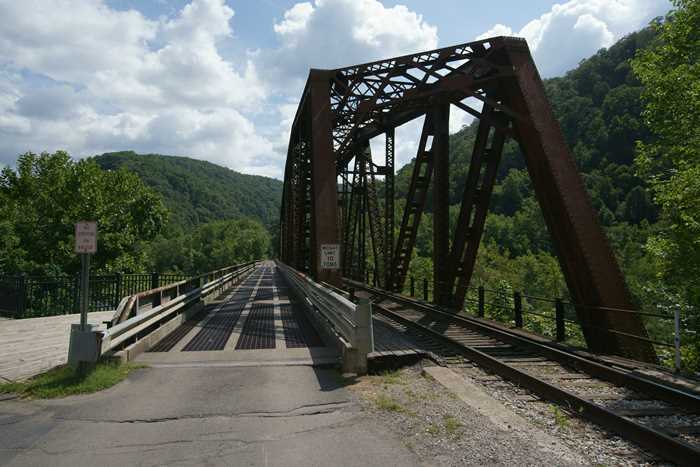 Thurmond is located in the New River Gorge, east of Oak Hill, West Virginia. From US 19, exit onto WV Route 16 in the Glen Jean area (south of Oak Hill), then watch for signs that point toward County Route 25 and Thurmond. When you arrive in Thurmond, cross the railroad/automobile bridge and park at the Amtrak station. Arriving in Thurmond is half the fun of visiting Thurmond. To get to the old town, you have to drive across this weird bridge. It’s a railroad bridge that includes an extra lane for vehicular traffic – almost as if it was added on as an afterthought (but it wasn’t — the road was part of the original bridge, built around 1915). Cross the bridge and park at the old Thurmond train depot. It’s the only place in the town with decent parking spots, and there’s no point in driving any further. The road continues across the railroad tracks and up a hill, but you’ll be headed into a residential area. It might be worth your while to go up there, to see an old church and some restored historic houses, but most of what you want to see is down by the railroad tracks. And, you really can’t drive any closer to the ghost town portion of Thurmond — you’re going to have to walk from here. 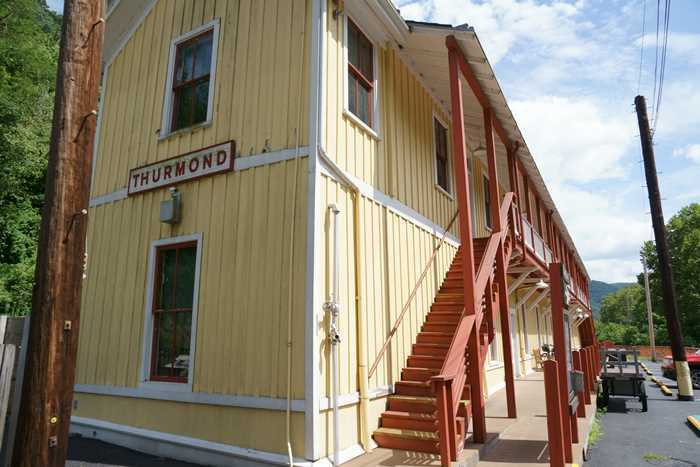 The Thurmond Depot now serves as a visitor center for the New River Gorge, and of course, the town of Thurmond. Both floors of the depot have been restored, and feature exhibits on the town and the railroad. The old railroad depot isn’t just a National Park visitor center – it also still serves as an Amtrak station. Three trains per week, in each direction, arrive each week on the Cardinal line, but not a lot of people get on or off here. Thurmond’s Amtrak station is the second-least used station in America, just ahead of Sanderson, Texas. In 2017 it served 345 passengers — less than one per day. However, these days, this is a modernized CSX rail line, with all the lights and signals you’d expect. 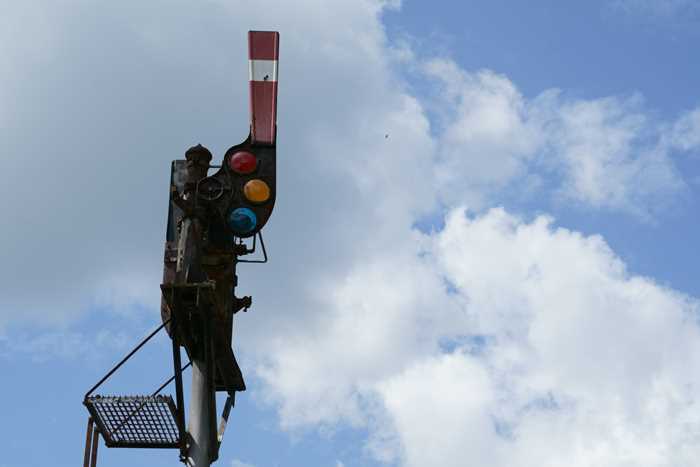 Keep this in mind — these are active railroad tracks, and more than likely you’re going to see a real train roll by at high speed. There’s a paved walkway that takes you from the train station into downtown. 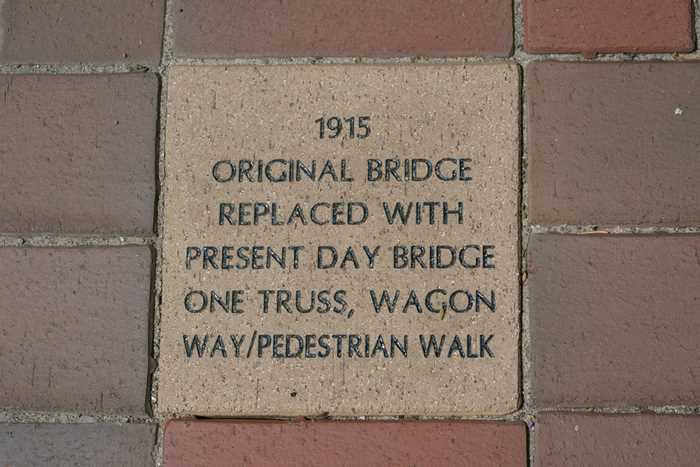 It features bricks engraved with historical events from the town — like this one, which explains that the crazy bridge you just drove over is more than a hundred years old. This tile says 1915, but I’ve also seen the bridge referenced as the 1916 bridge. Either way, it’s been there a while. Just three big buildings remain in downtown, the only survivors from what was once a much larger downtown district. 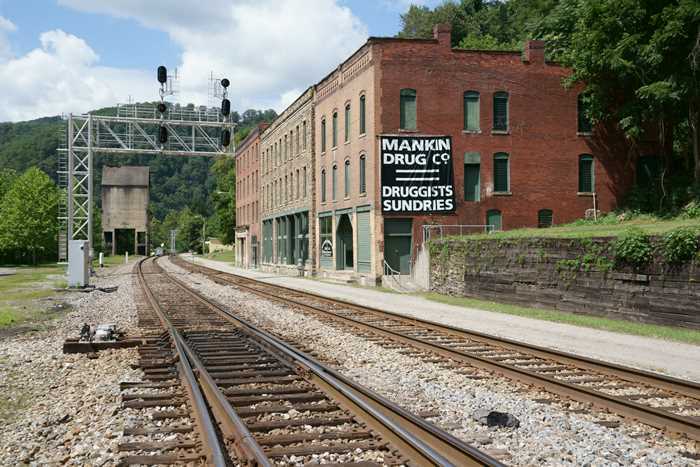 The building with the ghost sign – the Mankin building — was once at the edge of town. It included an office for Dr. Mankin – a C&O surgeon, and his wife, a pharmacist. Beyond the three brick buildings were several wooden structures, which didn’t survive. One of the biggest buildings, the old Thurmond Hotel, burned in 1963. 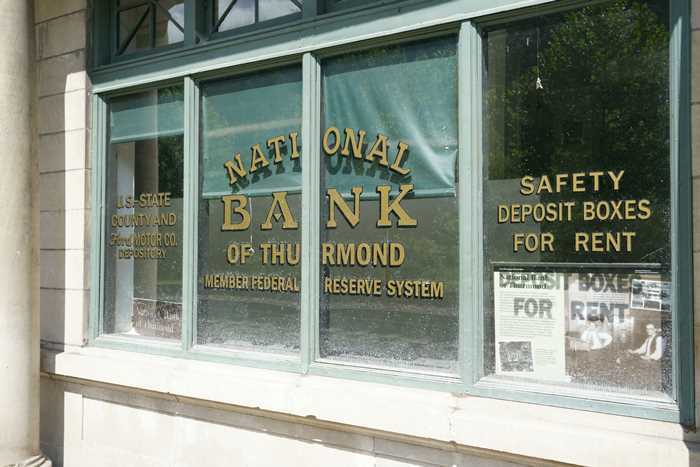 The third building is the National Bank of Thurmond, which still features painted windows on the storefront. The bank failed during the great depression. An attempted hotel-restaurant business attempted to breathe new life into the old building from 1975 to 1988, but eventually failed as well. Unfortunately, these buildings are not open to the public, but you can peek in the windows. Thurmond’s importance to the railroad declined when locomotives switched from steam power to diesel. The newer technology wasn’t just more fuel-efficient, it also required less maintenance, which made repair facilities like Thurmond’s less important. 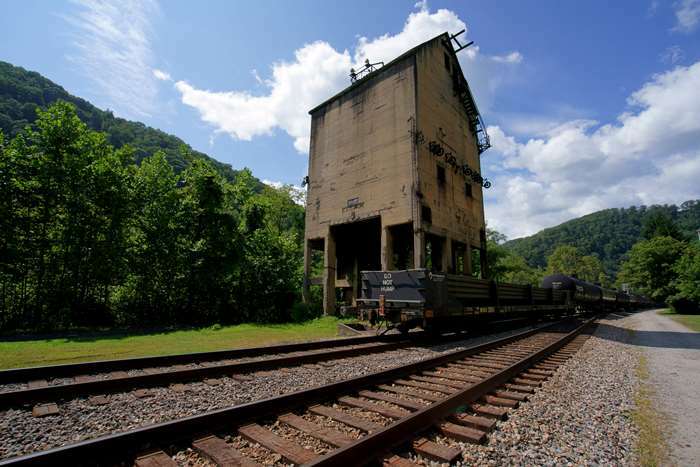 On the other side of the railroad tracks, there’s a big structure known as a “coaling tower”, which as the name suggests, was used to load coal onto the old steam locomotives. This one was built in 1922 and used up until 1960. There are no barriers, and you’re free to walk around or climb inside — but it’s not in good condition, so be careful. And don’t forget, these are active CSX rail lines. 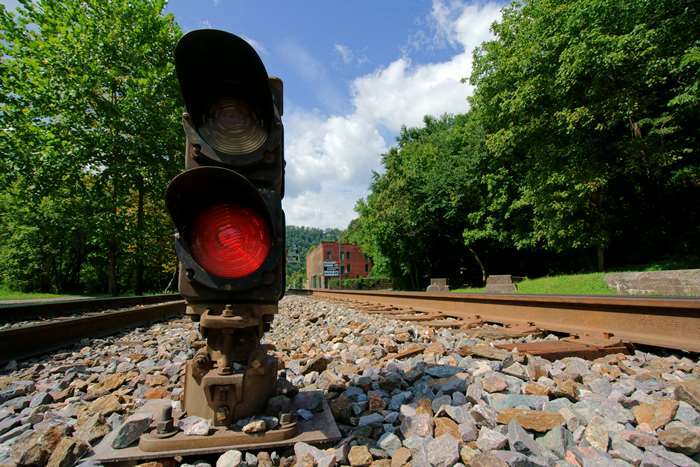 You should stay off the tracks at all times, and be aware of train traffic. Like so many other areas of the New River Gorge, the Thurmond area offers several good hiking trails. You can access the Rend Trail shortly before arriving in Thurmond, along the side of the road. The Rend Trail is an easy trail that follows an abandoned railroad grade back towards the town of Minden. The Southside Trail hugs the New River, and can be accessed from the Rend Trail, or from the Cunard River Access Road. Neither of these trails are accessed directly from Thurmond’s downtown district. The National Park Service breaks down all of your hiking options. 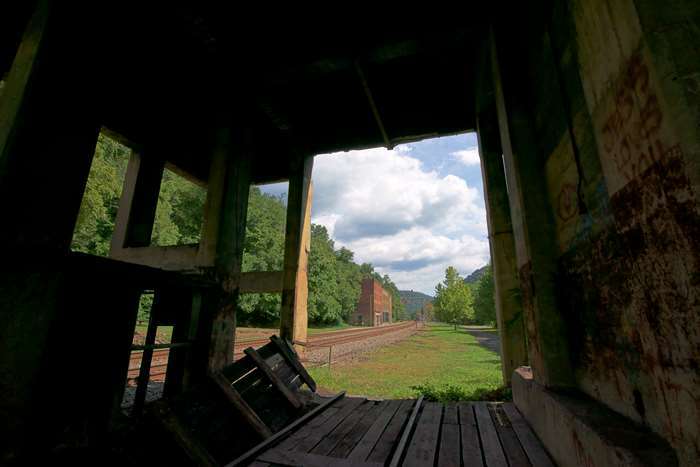 Thurmond is a treat for anyone who is interested in the New River Gorge, the history of coal mining and railroads in southern West Virginia, or ghost town explorers. The bridge into Thurmond is unique and photogenic, and the town itself doesn’t even have a street for its Main Street – it has railroad tracks instead! Take the time to make the drive out to Thurmond, if you’re in the area.